Growing up where I did, I’m going to be found dressed more casual than fancy more often than not. Don’t get me wrong, I love getting dressed up and will find just about any excuse to do so, but when you live by the beach, naturally your wardrobe is going to be a bit more on the relaxed side. This 4th of July will be no different. I’m going to keep it casual and fun during the day and spice it up at night! One thing that I can honestly say has changed about me since I’ve become a mom is how much I cheese out over the holidays. I was always a big fan of holidays, of course, but now that I have two kids, one of which is at the age where she can get excited about things, I may go a little over the top. I was never like that before, ha. 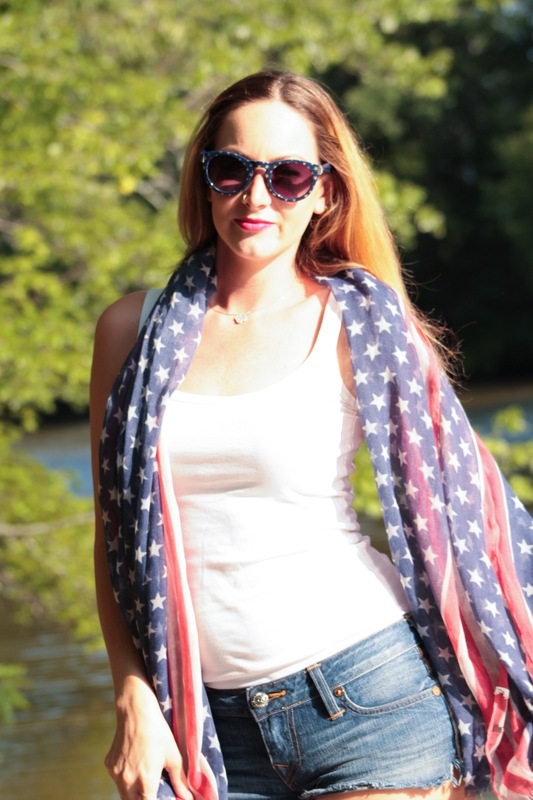 Now I’m like, “Americana sunglasses and scarf? Yes please!” If you want to test run the Americana trend but don’t want to go overboard, do what I did. Grab a few key accessories, like this scarf and these star-adorned sunglasses and keep the rest of your ensemble pretty simple. I went for a red lip to add a pop of color without wearing all of the colors of the American flag so literally. (Let’s all ignore the fact that I’m actually wearing an American flag). This is, without a doubt, one of the most comfortable sweaters I have ever owned! At a bargain, no less! You can find this bad boy at a local little boutique by my house for only $32. Amazingness. I love light weight, comfortable tops this like one because they’re an easy go-to when you’re at the beach and the sun starts to go down and there’s that subtle summer chill in the air. Kinda love that. I found this scarf a few months ago and knew it would be perfect for this particular holiday. It’s also quite useful as it doubles as a beach blanket when in need, score! This year we plan to take Charlotte out on the boat, paddle up the lake to a little restaurant on the water and have dinner, then watch the fireworks from the boat before we head home. It’s a great way to avoid crowds and traffic, as we hate both. ;] Let’s all keep our fingers crossed that this supposed storm does not ruin the weekend! Stay tuned for my 4th of July ‘night time’ look. Ain’t nothin casual about that one! 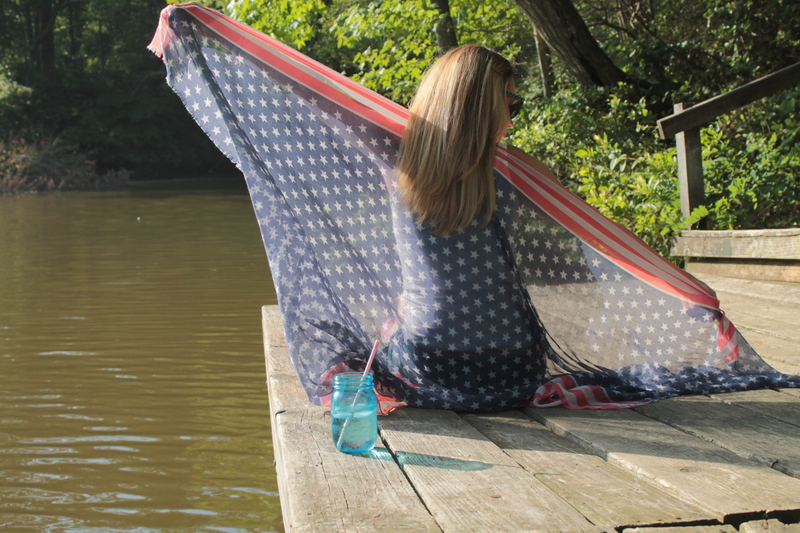 Next PostNext 4th of July Style: Festive & Fabulous!